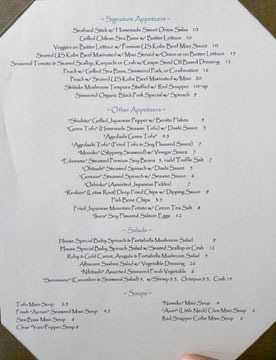 Opened in 1991 by brothers and former Matsuhisa chefs Tetsuya and Shunji Nakao (who left the partnership in 2000), Asanebo ("late riser") has been a staple of sorts on the Japanese scene here in LA. I first visited the place way back in 2008, and while I felt that the food was good, it didn't strike me as the sort of joint with a Michelin star, or the top food rating on Zagat for that matter. However, goaded on by a regular customer of the place who insisted that the best way to dine here isn't omakase, I decided to give Asanebo another shot, nearly six years after my initial visit. Asanebo's menu is scarily vast (especially when rendered in Papyrus font), with multiple omakase options ranging from $60 to $160 and a myriad of à la carte choices as well. It was a daunting proposition, so we all gleefully let the regular order for us. Click for larger versions. 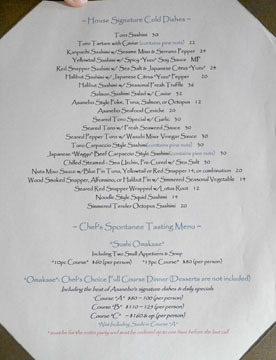 To drink, you'll find a smattering of beer and wine, as well as a short sake list that somehow features a $960 bottle of the stuff. We opted to bring our own booze, at $15 corkage a pop. Click for larger versions. 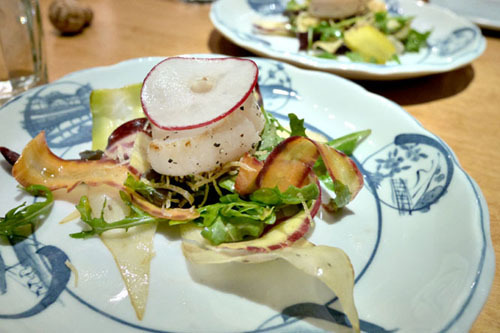 We began with a salad featuring a singular hotategai, which itself was spot on: supple to the bite and sweet, with a great hit of char and just a touch of citrus-y zest. The various veggies worked effectively as well, forming a crunchy, bitter counter to the scallop, with everything then accented by the savory bits sprinkled on top. 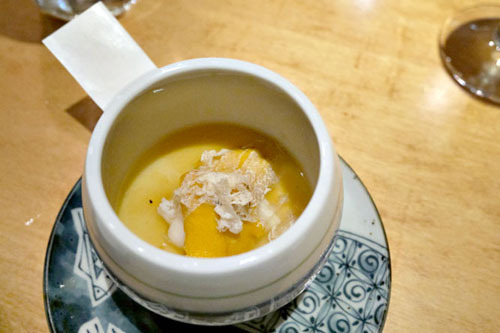 The chawanmushi was quite enjoyable, having Santa Barbara uni, spiny lobster, and white truffle folded in. It was certainly one of the most luxurious versions of the dish I've had, coming out all rich, buttery, and enrobed in truffle-y overtones, the urchin really accentuating the lushness of the egg while the ise ebi imparted a great snap to things. 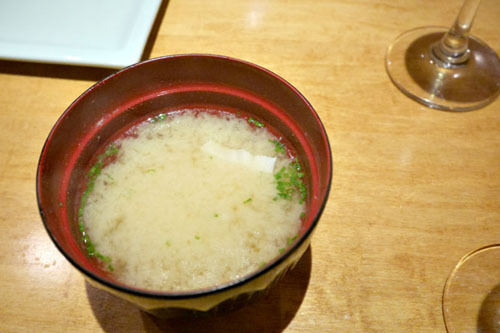 A miso soup with sea bass was exactly like you'd imagine, the hearty, satisfying, umami-rich savor of the soup enhanced by the ocean-y heft of the fish. We were then brought a rather long plate of various little bites: Japanese gingko nuts with sea salt; wonderfully savory and crisp fried lotus roots (renkon); a sweet-sour-savory cherry tomato in vinegar; mozuku seaweed with vinegar sauce and ginger, a slick, cool, tangy treat; a not overly gooey cut of okra; smooth, delicate bluefin tuna with nuta sweet miso; pumpkin and eggplant; a lightly-charred, yuzu-tinged golden eye snapper with enoki, my favorite; and finally, baby zucchini. 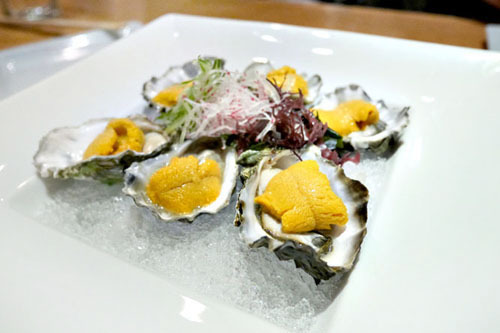 Kumamoto oysters were presented with sea urchin, a winning combination to be sure, with a touch of citrus really doing a great job in offsetting the richness of the roe. Unfortunately, the experience was marred by a bit of errant shell. 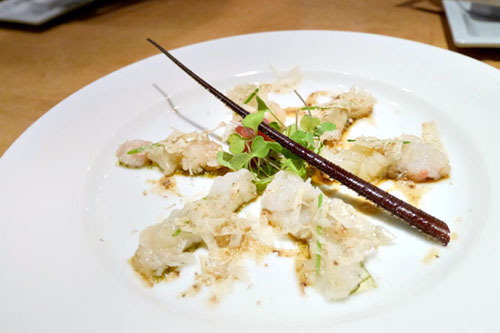 Spiny lobster was snappy and sweet, yet beautifully heightened by the depth of its soy-based dressing. That alone would've been good enough, but the earthy musk of white truffle just added further potency to the mix. 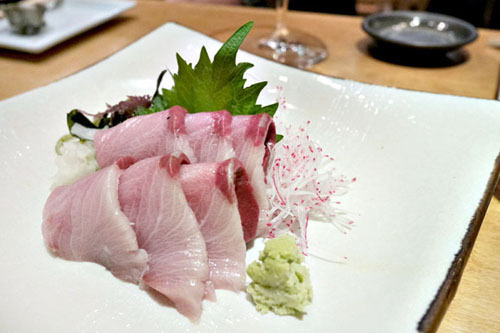 Wild yellowtail sashimi was clean and lean, not overtly fatty like the farmed stuff. A classic example of the fish--great with a dab of soy. 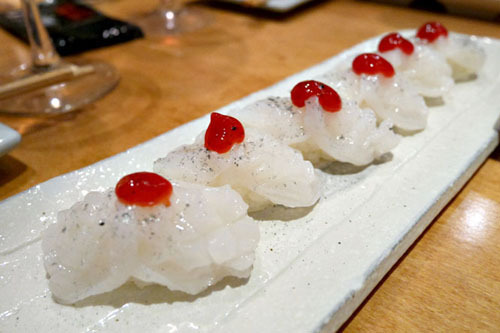 Tai came out snappy and delicate, deftly perked up with a sprinkle of tangy yuzu. Can't go wrong with this. The poke was tasty too, the meaty chunks of tuna really playing well with the tart-tangy crunch of its accompanying veggies. 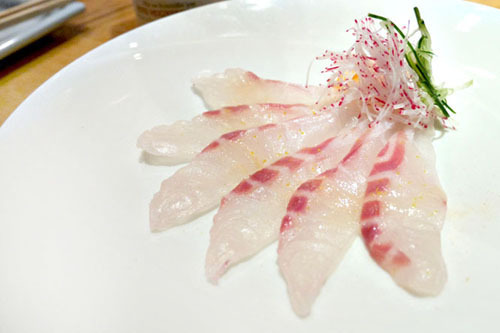 Halibut was one of my favs, the subtle taste of the fish expertly paired with the salty-sour-spicy kick of yuzukosho. 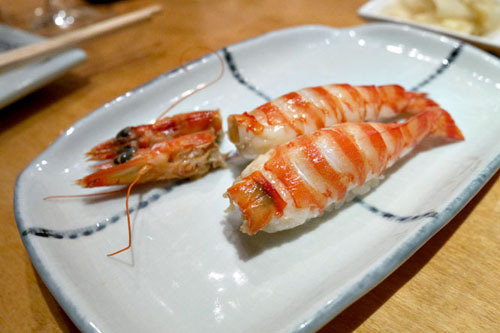 Tiger shrimp was a treat, and really a fantastic example of cooked ebi. 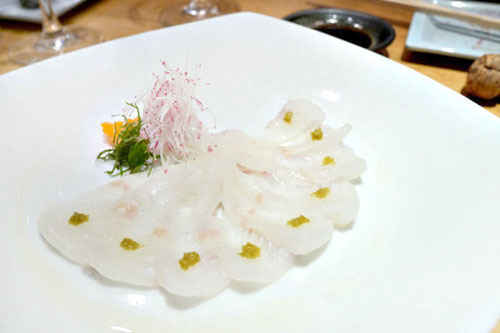 It showed off a beautiful texture, as well as an impressive interplay between sweet and saline flavors that really hit the spot. 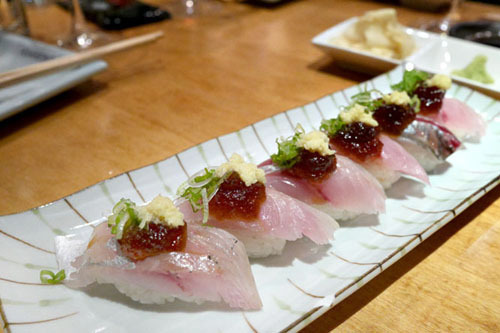 Spanish mackerel conveyed the classic pairing of ginger and scallion, but with the addition of a savory-sweet ponzu jelly. 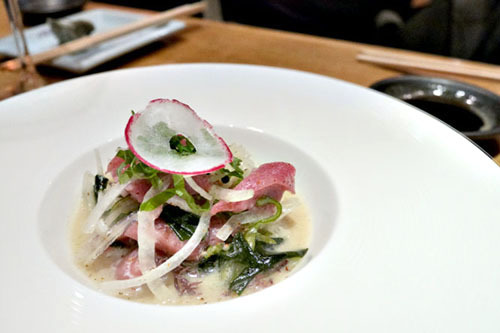 Octopus was a standout, with its delightfully chewy, yet supple consistency and mildly briny taste, amped up by a dollop of piquant umeboshi condiment. 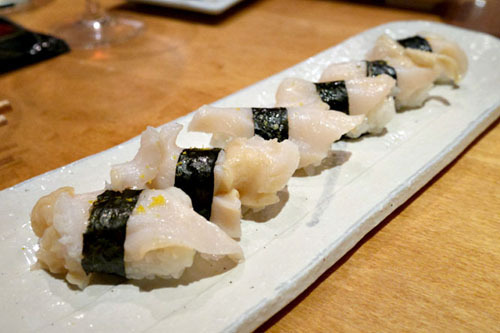 Geoduck, meanwhile, came out crunchy and tasting unapologetically of the sea, tempered by a squirt of citrus and the umami-ish relish of the nori. 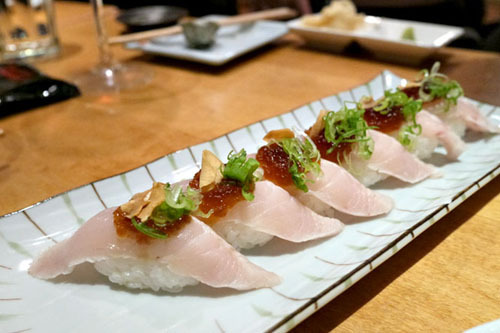 Japanese ono was balanced and multifaceted, with the tangy ponzu and crunchy, savory garlic chips imparting a modicum of modernity to the sushi. 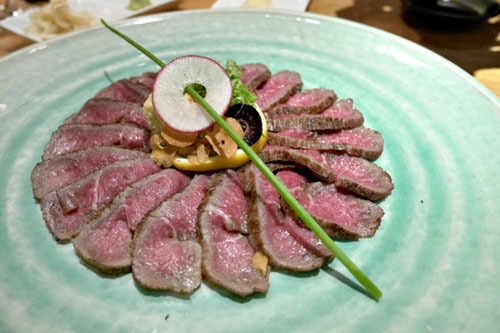 A shoulder cut of Kagoshima wagyu was presented in tataki form, displaying a somewhat restrained beefiness, offset by a ginger-y tone in the dish. Tasty, but I wanted a more luxurious, overtly bovine eating experience with this one. 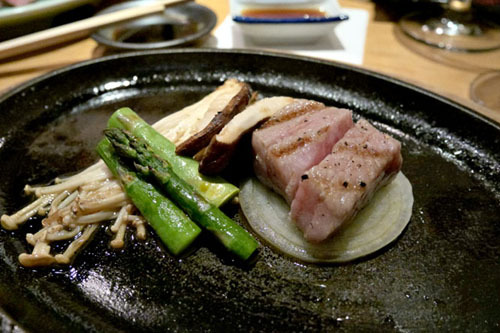 Now, speaking of that overt beefiness, the teppanyaki had it in droves, coming out just as rich, fatty, and buttery as you'd want, a true expression of wagyu. Superb rendition of mushrooms and asparagus here, too. 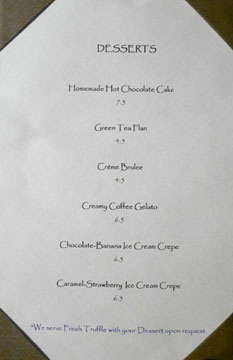 With the evening's pièce de résistance dispensed with, it was time for dessert. Click for larger versions. 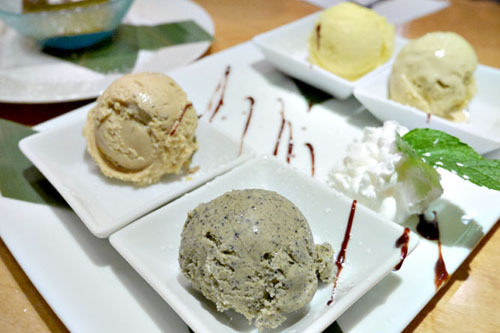 I rather liked Asanebo's quartet of ice cream. Starting clockwise from the bottom, we had the requisite black sesame, a fantastically true-to-life truffle, the delightfully tea-infused hojicha, and sweet potato. 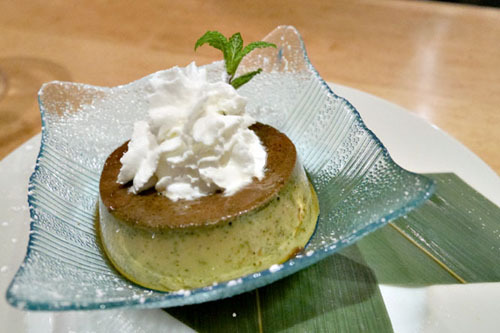 A trembling green tea flan was pleasant in its bittersweetness. 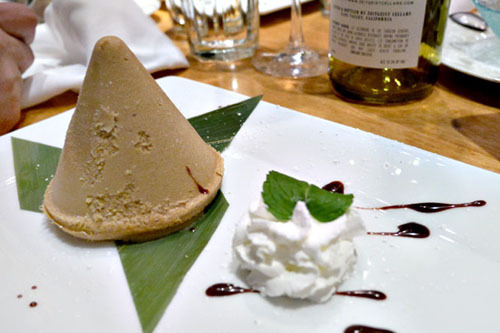 Finally, we had an oddly-shaped cone of coffee gelato. I enjoyed its semi-intense, espresso-like taste, but found the consistency too icy. I would've liked it smoother, creamier. I had a good time here, though the $250pp price tag was very surprising, especially considering that we didn't order alcohol (though we did pay for six bottles of corkage). I'm sure that the wagyu and truffle didn't help things either. 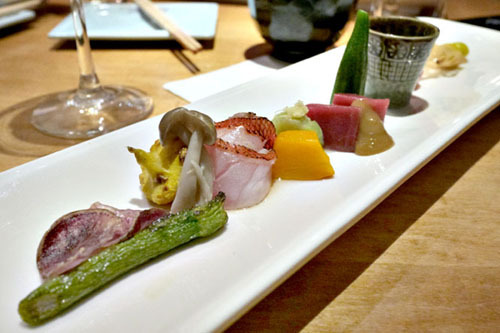 Cost aside, this was an improvement over my last meal, and indeed, unlike at pretty much every other Japanese place, omakase may not be the way to go at Asanebo. I guess it all comes down to what your expectations are. I wouldn't come in here looking to get a Mori-like experience for example, but rather, think of the restaurant as a sort of higher-class izakaya. 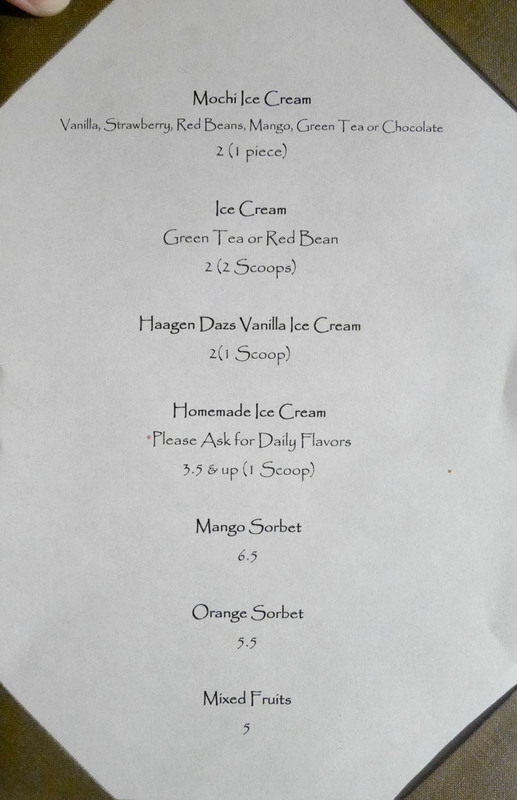 Just be careful what you order. How did it compare to your meals at Yamakase? The photos look a little soft and low dynamic range -- like they were very dim and you boosted them in software (I use Lightroom). I find the best being a Canon 5D M3 with a 100mm macro and a strong bounced light. But that's totally awkward at restaurants as you have to stand back 4 feet and have separate lighting. So a 50macro and ring flash work okay. These new mirrorless cameras don't seem to have good flash options, and nothing is sensitive enough to take a great picture in a dark room, although they do get better every year. 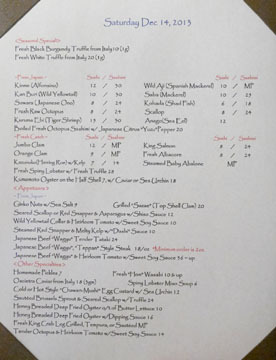 Luis: I'd go to Yamakase. Jieying: I did some controlled test shots at home across multiple ISOs (and same aperture/shutter), and the new camera is definitely superior in an apples-to-apples comparison, especially at high ISO levels. The Sony's trump card, though, is its built-in HDR function, which automatically combines three exposures into one, thus simultaneously reducing noise and increasing dynamic range. Josh: You should've come by and said hello. You certainly wouldn't have been the first person. Theoretically, natural light is always better. 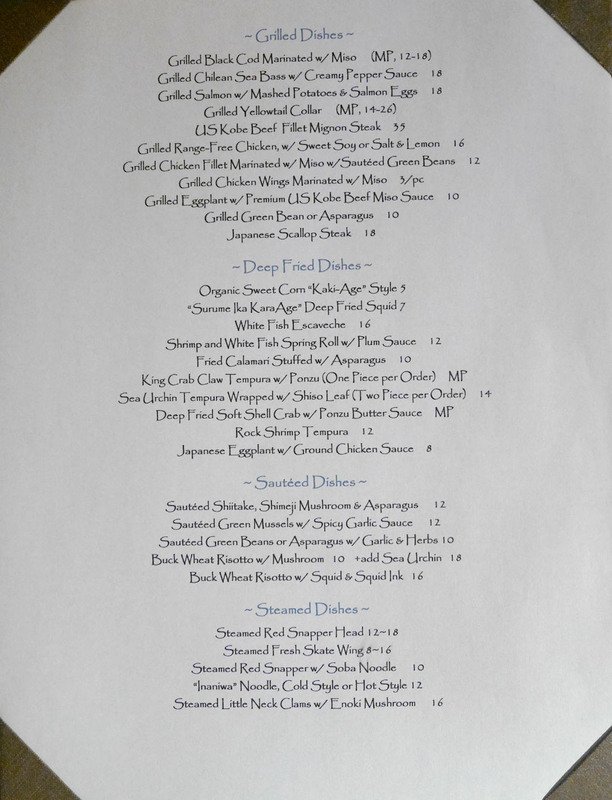 However, there just isn't even CLOSE to enough light in dim restaurants to make for good pictures. A good flash helps a lot.